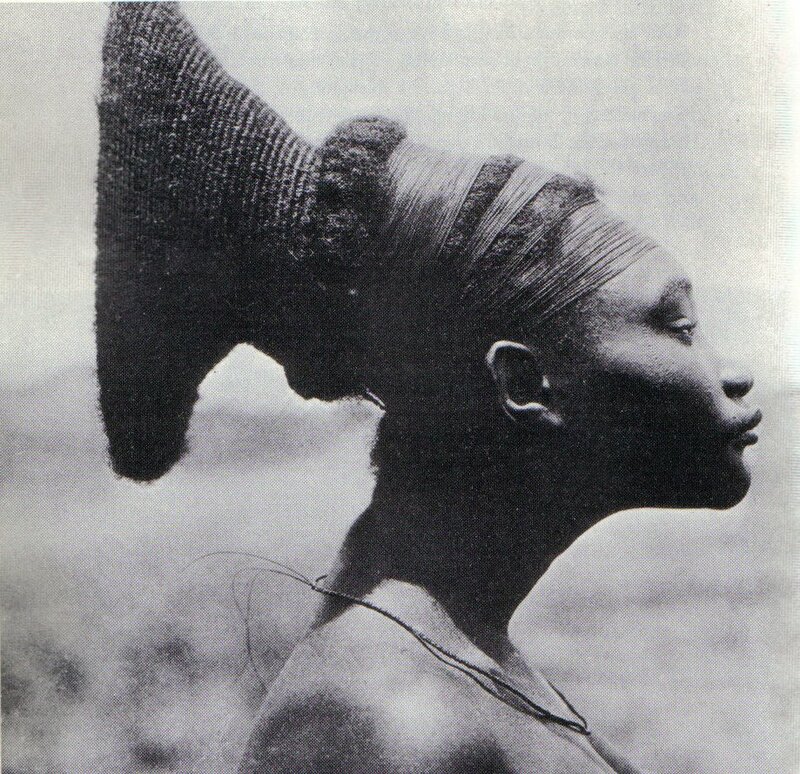 The hairstyle Padme wears with this costume seems to be inspired by an African headdress (Photo provided by Adi at Padawan's Guide). According to the ATOC Visual Dictionary, the "severe hairstyle conforms to diplomatic etiquette." The headdress in the movie appears to be decorated with antiqued embossed metal strips, but it could just as easily be embossed leather or some sort of molded and embossed synthetic material made to look like metal. 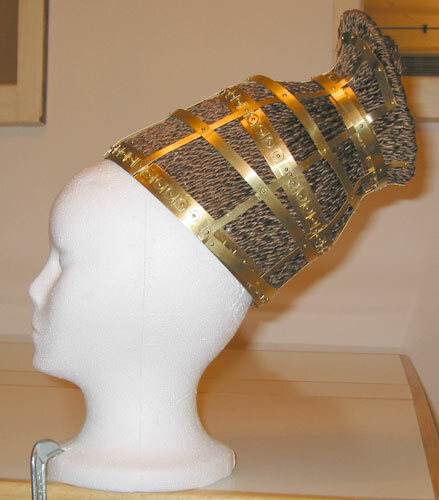 (Gold Plated styrene was used for one headdress to keep it light. Perhaps something similar was done with this). Fine micro braids cover some sort of support frame. (Perhaps buckram or a wire mesh frame). According to someone who helped with the FIDM Dressing a Galaxy exhibit, the headdress is light weight and they believe only one or two wig combs were used on the inside of the headdress to secure it in place. I chose to construct my headdress with using a hollow aluminum wire mesh frame covered with hand braided human hair. 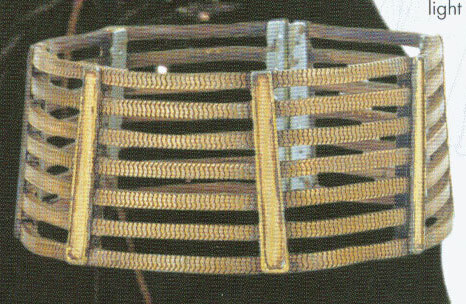 It is decorated with brass strips, brass wire, and brass rivets. 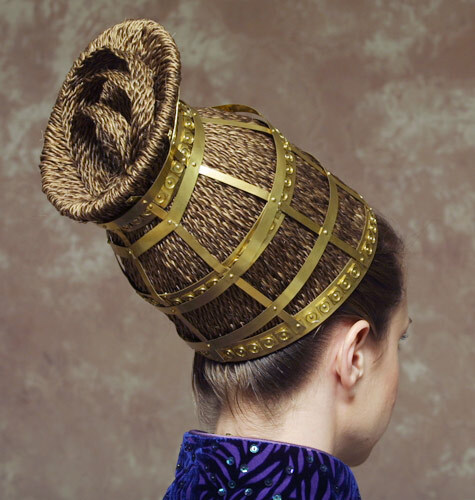 The headdress is held in place on my head with a row of wig combs sewn to the inside of the 'brim'. 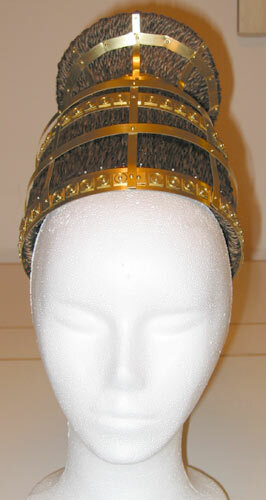 The headdress is actually quite heavy, most of the weight is due to the hair used. The brass adds a bit of weight as well. Unfortunately my headdress is a bit too small, as I forgot to account for the hair taking up space as it wrapped under the frame (first time hat maker mistake). To make this headdress, I created a wire basket like frame to lay my braids on top of. 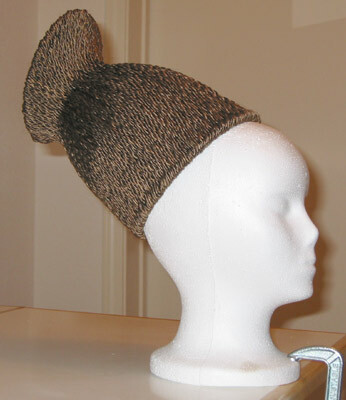 This helps give it a defined shape while keeping the headdress light because it is hollow on the inside. 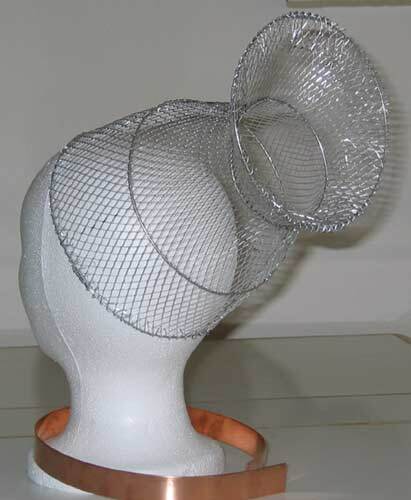 The diamond aluminum mesh is very light weight and I used 16 gauge wire for the 4 circular structures. 24 gauge wire was used to connect the wire to the mesh. I found the book Craft Workshop: Wire by Mary Maguire to be helpful in creating the design. I covered the wire frame with a light weight pellon fusible fleece. Initially, the fleece was washed and dyed with RIT using the stove top method. 1pt Cocoa Brown to 2pt Tan. The dye did not take well, so after covering the frame with the pellon fleece I painted it brown with Jacquard Textile Color (103 Orange and 111 Sky Blue were mixed to make brown). At that point I could put the headdress on my head and hold it in place with 2 bobby pins. It was very light before I added all of the hair. 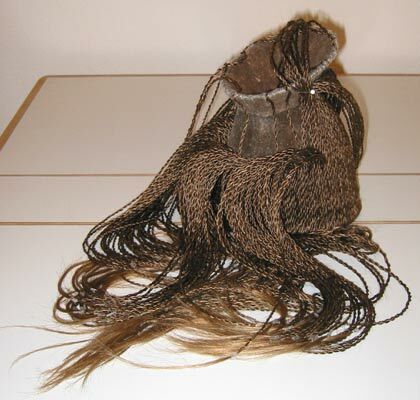 The real headdress used in the movie appears to use microbraided hair in a brunette color. This pre-braided hair can be purchased at beauty supply stores specializing in hair extensions (Sally Beauty Supply). Some online suppliers for this hair are EbonyLine.com, Doctored Locks and Gothic Castle. My hair is a medium ash blonde, so I was not able to use the pre-braided brunette hair wefts that can be found at some beauty supplies. I instead purchased American Silky human hair wefts in colors close to my own hair. After dyeing some of the hair wefts to remove the reddish cast, the hair was braided into two stranded twists (this took about 4 days). The braids were then sewn on to the pellon covered wire frame with invisible thread (this took about 8 days). 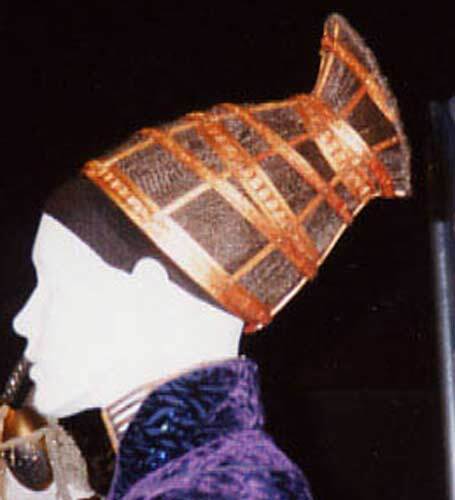 The outer part of the metal headdress used in the movie appears to be made from pattern wire strips (the decorative details on the metal can be seen in some photos). Unfortunately, the 1/2 inch copper pattern wire I found was much too thick a gauge (14) to use and would make the head dress too heavy (not to mention it's almost impossible to shape). 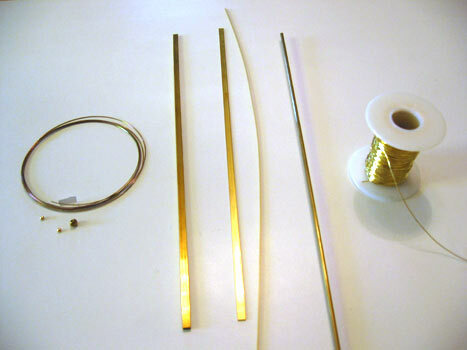 The 1/4" pattern wire I found was thin enough and light weight to use for the vertical strips - but I've decided to use plain yellow brass strips instead. I think the real head dress has the appearance of gold or red brass (which imitates the look of gold) Regular yellow brass is too yellow, and copper is a little too red. It's also a possibility that the real headdress isn't covered with metal, but with plastic or leather strips painted to look like metal. All of the rivets used on my headdress are decorative only. They were simply inserted and glued into holes that were drilled. I lacked the ability to actually forge my metal into the shapes needed for the headdress, but I did my best to cut and bend the metal into place. The weak link in this design is that it relies on super glue to hold it together (Only the 3 main large rings are held in a circular shape with screws). This makes the outer structure very fragile and some joints tend to pop if it's not handled delicately. Perhaps if I had used thinner metal (like foil for embossing) this would not be an issue. Also, foil would have been more pliable and easier to bend into some of the shapes needed. After reevaluating my design, I realise that flat metal strips do not conform correctly to the cone shape of the headdress as it spirals around it. I would have had to cut circular shaped strips from flat metal in order to get it to lay flat as it spiraled upward. 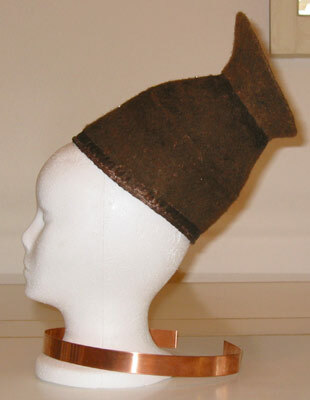 If I were to attempt this headdress again I'd experiment with embossing leather strips and painting them bronze. Padme's neckband is a "gift from the Naboo council". It appears to be made of flat rectangular shaped herringbone or snake chains (similar to what is used on bracelets) held in place with long spacer bars. The circumference of the chains at the top is slightly smaller than at the bottom of the necklace. 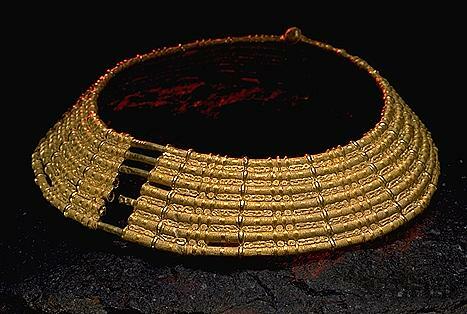 The design may have been inspired by 7 ring gold collars dating back to 375 BC - 550 AD. Obi-Anne of the Jedi Council Forums found an example of such a piece at the Historiska museet (Historical Museum) in Stockholm Sweden. brass rectangular tube 3/32 X 3/16 12"
flat brass bar 1/32x3/16 36"
flat brass bar 1/64x1/16 36"
yellow brass wire 22 gauge. I used a variety of yellow brass strips to construct the vertical slats and spacer bars. I don't have the ability to solder my pieces, so I opted to make the vertical slats into spacer bars using zap-a-gap glue. The yellow brass was antiqued with Chocolate Brown Copper and Brass Oxidizer from Caswell Inc. I was not able to find the sort of chain used on the real necklace, so I opted to make hollow slinky-like coils. 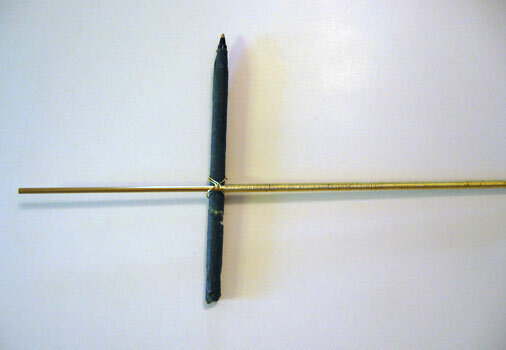 I wrapped 22 gauge brass wire around a 1/8" diameter round brass rod, and then slid the long wrapped coil off the rod. After making 7 of these long wrapped hollow coils, I threaded memory wire inside each coil to give them a circular shape. 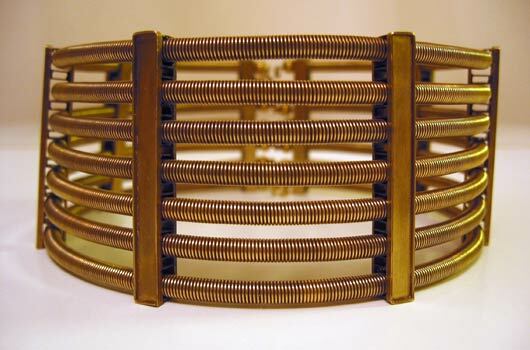 These coils that make up the horizontal slats of the necklace are light weight and easily bendable. My necklace came out slightly larger in circumference than I would have liked, but because all the pieces are glued in place I can't cut off the 1/2" or so needed to make it perfect. 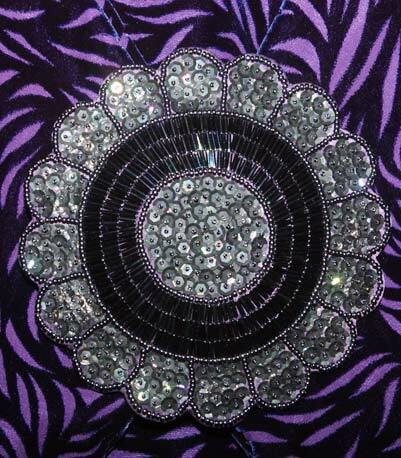 The back ends of the large pocket sleeves on the coat are held in place with a large beaded brooch. 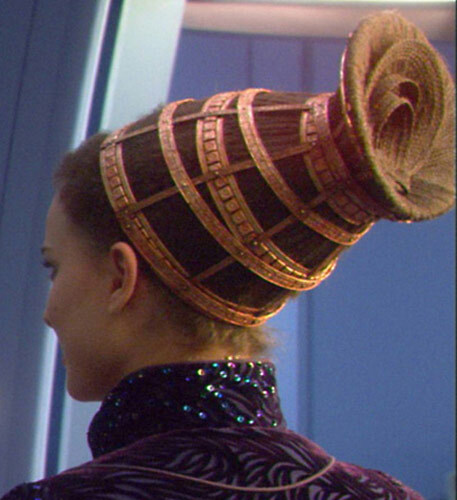 DESIGN NOTES: I believe that the brooch worn on the back of Padme's Purple Senate Costume is between 4 and 5 inches in diameter. My attempt to scale the pattern based on the use of 3 rows worth of 6mm bugle beads resulted in a pattern just over 5 inches in diameter and I now believe this is too large (but it will have to do). I also believe that the real brooch uses 4mm bugle beads instead of 6mm bugle beads. If I were to make this brooch again I'd use a 4.5" pattern instead. I drafted a pattern in Adobe Illustrator, then printed and traced it on to purple silk. Seed Beads were embroidered on to the silk using a couching stitch. The sequins are held in place with 15/0-82 metallic navy seed beads. I printed the pattern two more times and placed it on top of polystyrene sheets with double stick tape to cut out a flower shaped mounting and a backing sheet. (Polystyrene can be filed after it's cut to give you smooth edges and it's very strong and rigid). 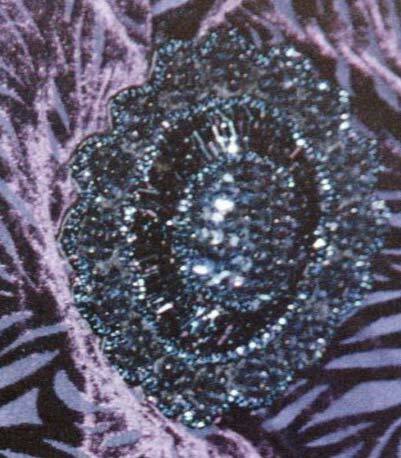 A bit of poly fiber fill was placed in the center of the mounting sheet to give the brooch more of a 3-D effect. The finished embroidery was then glued on the flower shaped polystyrene mounting with Fabri-Tac clear adhesive (be careful not to use too much or it will seep on to your sequins through the fabric). Finally, the flower shaped polystyrene backing was painted with purple acrylic paint and glued on the back with hobby cement to hide the raw edges of the silk that were folded over the mounting. I then glued 3 1.5" brass Pin Backs to the back of the brooch. Warning About Polystyrene: Be careful if you decide to use polystyrene. Only use glues that are safe for polystyrene. When using cement made for polystyrene, use it sparingly. Most super glues and CA adhesives will actually dissolve polystyrene or warp it. Also be sure to use acrylic paint because some other paints might cause the polystyrene to warp or bubble. For more information about Styrene see this article at trains.com.